Most of us spend our days running from task to task at work, racing to stay on top of emails, pings, and meetings. But as Gary Hamel asked us in his Workhuman keynote in Nashville this morning, “What the hell is the point of all of this?” The crowd erupted. It’s clear that Gary’s message that “life is too short to work on inconsequential problems” resonated with the Workhuman audience. Despite the fact that management consultant Mary Parker Follett was talking about bringing humanity back to work in the early 1900s, we still have an incredibly long way to go. Gary referenced Gallup data that less than 20 percent of employees are fully engaged at work and half of workers have had to change jobs to escape a bad boss. “This kind of soft tyranny is just stupid,” he said. The problem is people are increasingly working on bureaucratic tasks that lack meaning and creativity. Gary referenced data that growth of administrative and manager roles has more than doubled since 1983. “A third of human capacity is dedicated to bureaucracy,” he said. You might be thinking that the idea of getting rid of bureaucracy sounds great in theory, but how can you make it real back in your organization? Gary shared five steps. Count the cost – “We don’t pay attention to things we don’t measure,” said Gary. So let’s start measuring the cost of bureaucracy – of people not being able to make decisions for themselves and just use common sense at work. He gave the example of data that came out about 20 years ago that each year 100,00 lives are lost due to medical errors. Since that data came out, important strides have been made in the quality of care and fewer lives are being lost. Could the same positive change happen with management practices? Learn from the vanguard – Most of us have only ever worked in bureaucratic environments. “It’s hard to imagine anything other than bureaucracy,” said Gary. 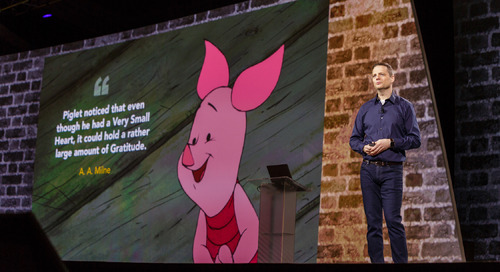 He urged the Workhuman audience to look to companies like Haier, Valve, Nucor, and Red Hat – companies that are doing things like crowdsourcing strategy and creating thousands of micro-enterprises instead of formal hierarchy. “If you think digital disruption was hard, wait ‘til you see management disruption,” he said. Build a coalition of the willing – “You can’t build a human-centric organization without re-distributing power,” said Gary. Don’t expect the leaders in your organization to lead the charge of getting rid of bureaucracy. This won’t happen top down. Experimentation – Be willing to try something new – to give up some of the power. You might be surprised by the results. Gary ended the session with one important thought: “Every human being has a right to develop their gifts.” Are you letting the humans in your organization thrive and develop their gifts? As you look at the way people are recognized and developed at your company, would Gary approve? Maybe that’s where you can focus change. Enjoyed this recap? Check out our interview with Gary here.